How can you build and sell the perfect marketing funnel? On our 20th podcast episode, Mike Killen, the founder of Sell Your Service, lists the crucial steps of creating a high-converting funnel and explains why Thank You pages are vastly underrated. Mike Killen is a leading British marketing expert and the founder of Sell Your Service, helping funnel builders achieve their maximum income potential through training, programs, courses, coaching and resources. Mike has helped over 2,000 funnel builders sell more funnels to their customers and increase their maximum income. 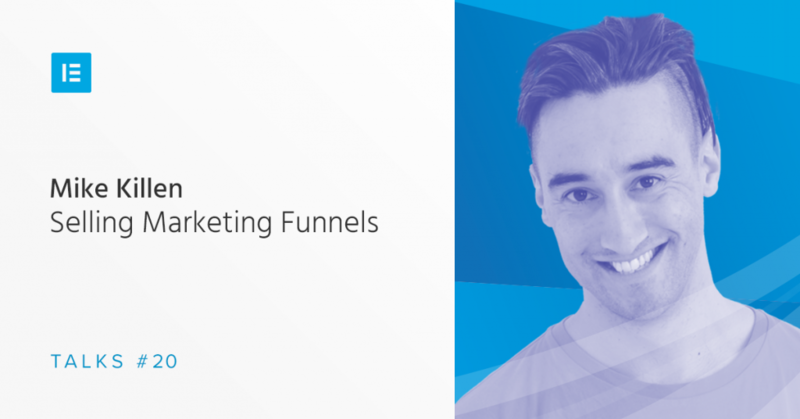 “The first rule of selling marketing funnels is that you don’t talk about marketing funnels. The biggest mistake I think people make with their customers is they say, ‘Well, we’ve got all these opportunities, we’ve got a page builder and we can create landing pages and squeeze pages and opt-in forms and we can connect to people’s CRMs,’ and as designers and developers and creators, we get very excited about that and we understand that all of those coming together, just trying to convert a lead or a prospect into a sale and then a sale into a bigger sale. “When it comes to selling, I think we all have reservations about selling a website for $10,000 or 10 grand or 25 grand or a marketing funnel for 25 grand. And we all kind of, we get ourselves in a bit of a bit of a panic about how much we should be charging. And I found time and time again the way to sell anything, and this comes from my heavy, heavy background in sales, is to not make a list of the things the customer wants and then think of a price. It’s to think of a price first and then work out what you want to give the customer. And I think that’s the big mistake is a lot of funnel builders when they get into this area and, and you know, you’ve provided them with this new opportunity for opt-in forms, right? A lot of people are then going to say, ‘Well I want to provide that to my customer so I’m going to make a list of all the things that they want.’ And they could get an email list growth and we can put blog posts on opt-in forms and when we think, ‘Well, how much can I charge for that?’ And we do all sorts of things that are bad habits. We look at the market. We see what other people are charging. We ask our customers what they would pay for it and that’s wrong. That’s fundamentally the wrong approach. Instead, what you need to do is think, how much do I want to earn per customer or earn per project or earn per year and work backward from that and think what am I going to have to deliver to justify that $25,000 price or that $10,000 price. “The internet has changed the boundaries of where geography lies. We have customers literally all over the world. You’ve got customers literally all over the world and even as a small business or even as a one-person organization, you can have marketing funnel customers and website customers all over the world. The problem is that people try to remain generalists because they’d believe that that’s the best route to finding a customer. Because if you’re open to all offers and open to all projects, then you’re more likely to find customers. As more and more funnel builders enter the market, and this isn’t a slight against page builders. Page builders have been instrumental, but as more people learn how to use page builders and marketing systems and automation systems become more accessible … I’m a big fan of Active Campaign for example, and their automation is for the equivalent of whatever it is, 70 bucks a month is 10 times more powerful than the things we were spending tens of thousands of dollars on per month just to get the same functionality. So it’s clearly not the tools that separate you because they get easier and faster. It’s not being able to just provide everything because everyone is able to provide everything. So the way that you have to be able to find customers is by choosing a very specific niche. “That’s something that only in the last few months I’ve become extremely passionate and clear about. I’m part of a couple of networks, one of which was with a guy called Daniel Priestly, and they’ve helped you work that out. The reason why is mainly around confidence. Confident businesses and confident people don’t take risks. The reality is if a business knows that they can make sales, even if they’ve got no customers and there’s nothing on the horizon, and for whatever reason, all of their customers are falling off a cliff. Every business faces that some point, they’re just … their customers and their influence and their leads. Everything just disappears. It happens. But if people have got the confidence to know, ‘I can make a sale’, ‘I know how to generate money and income.’ That creates confidence in myself and it creates security. If I’m confident and secure, I’m less likely to make stupid decisions and take stupid risks. The reason that people are conned into … well, by con artists into giving them money is because they looking for getting rich quick schemes. The reason that people, that kids, especially in many places around the world, get into things like selling drugs, is because they believe that that is the only thing that they can sell. Selling is not about making money and it’s not about closing the deal on a customer generating revenue. It’s about serving an audience. Every single human being in the world at some point has to prove their point, prove that they’re worth something and prove their argument if they want something done. And if we understand how to sell at a young age and tell those stories, we become more confident people and I think we can kind of begin working on areas that really matter as opposed to some of the stuff that I believe is kind of wasted taught in school. “The thank you page for us is where we have generated so much revenue. After someone opts in, you guys have got this new opt-in forms and people opt-in and they want to download the PDF or the report or the video or whatever they have opted in for. Instead of taking them immediately to the delivery page, instead of giving them that download, you say, ‘Thanks very much. We’re going to send that to your email address just to make sure that you’ve given us your real email address. We’re going to send it to your email address.’ And you redirect them to a Thank You page. Now, from a specification standpoint, you can put your tracking pixels in there. You can put conversion pixels. One of the other tools that I use is called Oribi, which is my analytics platform. I don’t use Google Analytics and you can measure things much easier when you have the Thank You page. On that Thank You page, you can then have a video or a sales message to that same person because you never know the person who just downloaded the report on how to sell your app to free customers might then want some training for $19. That Splinter product we talked about earlier or free access to you or even some paid consultation or coaching. Matan is a Content Manager at Elementor. He worked as an Editor-in-Chief for various websites, as well as a Radio Broadcaster and Editor. Thanks Matan, there are some helpful pointers here.